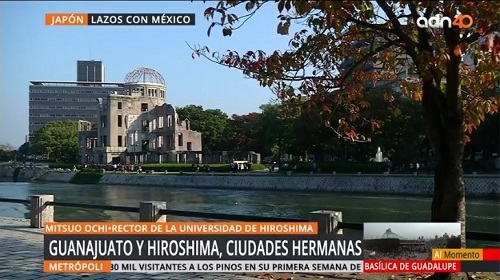 In October 2018, a program of the Mexican TV channel "TV Azteca" interviewed Hiroshima University President Mitsuo Ochi. and the program was broadcast in Mexico in early December. The program entitled “Lazos entre Hiroshima y Guanajuato | adn 40” presents the academic, industrial and administrative exchanges performed between Hiroshima and Guanajuato since 2014. The 3rd Japan-Mexico Rector's Summit held in Hiroshima hosted by Hiroshima University in November 2017 was also mentioned. In the interview, President Ochi said: “The condition of sister cities between Guanajuato and Hiroshima has given us good opportunities for collaboration among industry, academia, and government. For example, an automotive industry area has been established in Guanajuato with Japanese companies who have their headquarters in Hiroshima. From an academic point of view, Hiroshima University and the University of Guanajuato have a good relationship, so we have established an academic extension center called Hiroshima University Guanajuato Center on a premise of the University of Guanajuato.